Corporate Governance Risk Pty Ltd (CGR) is a business and technical process risk service that markets a web-based application to manage risk for all levels of business. Based in Perth, Australia, CGR has been in operation for more than two years and has domestic and international clients in the oil and gas, mining, health, and retail sectors. To use the CGR service, clients consider their business goals and enter information about their risk factors and organizational processes into a web application. The application first evaluates the risk and compliance profiles and identifies mitigation strategies. The application then provides reports that senior executives can use to make immediate, medium and long-term forecasts and decisions. CGR also needed to scale quickly to meet demand for its application during peak compliance reporting periods, when the load on CPU resources could increase by 200% and demand for memory resources by 300%. The organization also wanted to be able to meet typical business demands: to add resources during the day and scale down when clients shut down for the evening. Furthermore, CGR wanted a partner that would grow with the business as it became more successful. “As we take on new clients and get word from our existing clients that they want to bring more users on board, we need the ability to easily add capacity,” says Jones. The organization was originally working with another hosting provider for its web application, but soon found that its services, particularly billing and redundancy for back-end services, were relatively inflexible. CGR then engaged Amazon Web Services (AWS) because of the strong AWS brand reputation and the knowledge that AWS infrastructure could support clients and distributors in Europe. At that time, AWS was already well known with the CGR development team. Most of them used AWS before and they were familiar with the application programming interfaces (APIs) that act as the interface to services. The CGR developers knew that AWS would easily allow them to add capacity for a set number of hours to support increases in demand from clients, and then remove that capacity during quieter periods. 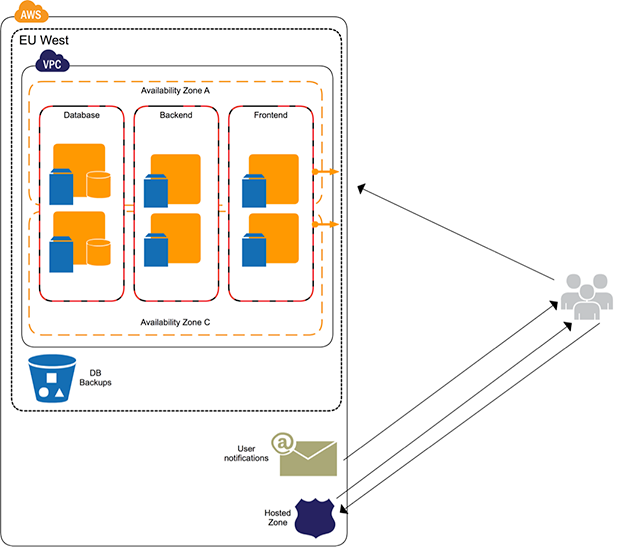 CGR began by using Amazon Elastic Compute Cloud (Amazon EC2) with Amazon Elastic Block Store (Amazon EBS) for a scalable infrastructure and Amazon Virtual Private Cloud (Amazon VPC) to run the CGR application on an isolated section of the AWS Cloud. Later, the development team added Amazon Route 53 to act as a primary domain name server and keep track of internal servers, and Amazon Simple Storage Service (Amazon S3) to back up database information. The figure below provides a diagram of CGR’s site architecture. Using AWS, CGR is able to service its European clientele with an average three-second reduction in response time. CGR regularly backs up its databases every six hours, ensuring that client data is available for retrieval on request or in the event of a system issue. CGR has taken advantage of the bandwidth between datacenters operating in the same Region to locate its databases across two Availability Zones. This means that if one Availability Zone is unavailable, the CGR application and database servers in the other Availability Zone can take up the load. “AWS has been fantastic in letting us plan for the worst and minimize the prospect of disruption to our clients,” Jones says.